Colorful foliage, falling leaves and cooler temperatures signal that it is time to store away your summer small equipment and get ready for winter. 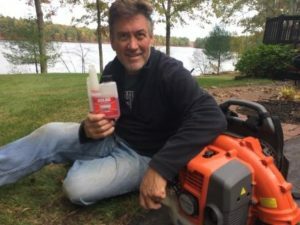 Small engines, like those in lawnmowers, leaf blowers, and string trimmers, need proper care and maintenance so that they will be ready for action when spring returns. It is also a good time to prepare your snow blower for the upcoming winter season. Keep your owner’s manual handy for reference as required. Whether the lawnmower is a ride-on or push design, these tips will help you prepare your small engines for winter storage. STEP 1 – Run the engine until the fuel tank is empty. STEP 2 – Remove the spark plug wire and drain any gas that may remain in the tank. Inspect the spark plug for corrosion and replace if necessary. STEP 3 – Add fresh gasoline that has been treated with STA-BIL® Fuel Stabilizer to the tank. STEP 4 – Reattach the spark plug wire and run the engine for a few minutes so that the fuel stabilizer can circulate through the carburetor. STEP 5 – Shut off the engine, disconnect the spark plug and fill the fuel tank completely. This will prevent moisture from entering the system, condensing in the tank and causing rust that can clog the carburetor. STA-BIL® will help keep the fuel fresh over the winter. STEP 6 – Drain the oil and replace both the oil and air filters. STEP 7 – Refill the engine with new oil. STEP 8 – Remove the battery if one is present and clean the terminals. STEP 9 – Fully charge the battery and store it in a separate location. STEP 10 – Clean the mower to remove any dirt and debris, which increases the risk for rust. STEP 11 – Inspect the lawn mower. Tighten and replace any loose or missing nuts, bolts, and screws. STEP 12 – Sharpen and balance the mower blades. Replace these parts as required. STEP 13 – Store lawnmowers, leaf blowers, and other summer equipment in a dry, sheltered place, such as a garage or a shed. STEP 14 – Protect the tires by placing the mower on wooden pallets instead of directly on a concrete floor. Gasoline can become stale over a short time if not treated with STA-BIL® Fuel Stabilizer. Proactive maintenance and using products like STA-BIL® Fuel Stabilizer will help ensure that your seasonal equipment is ready when you need them. STEP 1 – If your lawnmower or trimmer won’t start, add Start Your Engines!® fuel system revitalizer to the fuel tank before starting. The formula is perfect for small 2- and 4-cycle engines that have been in storage for several months. By revitalizing the fuel and removing any gunk or other deposits, it will help ensure that your engine starts more easily. Lubricate the drive and chassis to ensure that the parts move smoothly. STEP 2 – Inspect drive belts for wear and replace any that are worn out. STEP 3 – Check the tires and add air if necessary. STEP 4 – Reattach the spark plug wire. Reinstall the battery if required. STEP 5 – Start the engine and let it run for a few minutes in a well-ventilated area to ensure that it operates correctly.